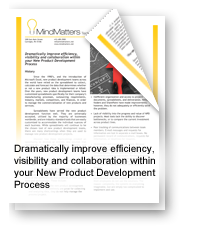 New Product Development – We help accelerate your new product development processes, improve speed-to-market and increase your return-on-investment! The goal of the New Product Development Process Assessment is to dramatically improve the results of your product development process. During the Assessment, the MindMatters’ Team examines the characteristics of your organization, your goals and objectives, your employee demographics and culture, as well as, current and previous innovation and product development process and implementation programs to arrive at a plan for improving innovation and designing and implementing an efficient and profitable new product development process. The purpose of the Assessment is two-fold. 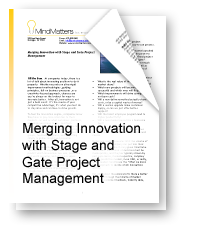 First, to identify a comprehensive set of recommendations for building your organization’s innovation and new product pipeline, and second, to identify your most pressing new product development process challenges that need to be solved and implemented. At the end of the New Product Development Process Assessment, utilizing our two decades of innovation and product development expertise and best practice experience, we provide management with the results of our assessment, as well as, a comprehensive set of recommendations to help you achieve your desired results and improve the speed-to-market, ROI and profitability of your product development efforts.